It’s April – Happy National Poetry Month! Check out the Academy of American Poets for a month of resources and celebrations, where among other things you can subscribe to the appearance of a previously unpublished poem by a contemporary poet in your inbox each day! Children’s poets will keep the Kidlitosphere hopping as well. Explore some of the offerings here, in a round-up compiled by Jama Rattigan for her Alphabet Soup blog. One of those great kidlit events is coordinated by poet and novelist (and my dear friend) Irene Latham. For the second year, Irene has organized a “Progressive Poem,” with a different children’s poet adding a line each day. Click here for the daily schedule as the poem unfurls blog by blog. When not rounding up other poets, Irene divides her time between writing, speaking, and “living a life worth writing about”! 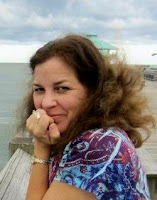 This well-traveled mom of three has published more than 170 poems, is poetry editor of the Birmingham Arts Journal, and is the author of two novels for young readers: LEAVING GEE’S BEND (G. P. Putnam’s Sons, 2010), which trails several awards, and DON’T FEED THE BOY (Roaring Brook Press, 2012) just out in the fall. I’ve recently finished this tale of self-discovery, belonging, and friendship, illustrated with warm drawings by Stephanie Graegin, and thought it would be fun to look for ways Irene’s poetic sensibilities might have snuck in to a traditionally crafted novel. 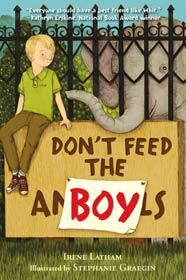 In DON’T FEED THE BOY, 11-year-old Whit wants to escape his life – or at least the zoo, where he’s spent all of his days and has been homeschooled on the premises. What an amazing life that would be, right? Well, maybe not if you don’t happen to be as animal-crazy as your zoo director mother and head elephant keeper father. Maybe not if they are always managing some crisis providing the best care they can for their animals and you feel they hardly even notice you. When Whit meets the “Bird Girl,” someone his own age who comes to the zoo every day to draw, he soon discovers that the grass might not always be greener on the other side of the zoo fence. His family has problems, sure, but Stella’s? Whit’s attempts to help improve Stella’s life result in complicated and dangerous choices for both of them. Whit pulled his eyes away from Ferdinand and scanned the sidewalk for Stella’s white T-shirt and dark cascade of hair. Now, if I were reading these words in a poem, I’d notice a few things. First, those verbs do some heavy lifting, as we’ve discussed before. Whit didn’t just “see” and “look for” here.” He “pulled his eyes away from” and “scanned”. See the difference? Now, what about the sounds of the words? “Scanned” is fun to read after “Ferdinand” – it even rhymes! Read this sentence again, this time listening for all the ‘s’ sounds – eyes, scanned, sidewalk, Stella’s, cascade. I’m not saying Irene consciously counted each ‘s’ – she’d probably still be writing the draft! – but the alliteration here contributes to a delicious description. Now, read this sentence aloud and hear how it is rhythmic – I personally love the “DARK casCADE of HAIR” at the end. And you’ll notice it’s a lengthy sentence, not a quick, clipped action – as readers, we are scanning and searching, too. What poetic devices do you notice in this description of Stella’s father? …Phil barking his orders from his sad lump of chair and belly and blanket in front of the TV. “…sad lump of chair and belly and blanket” – can’t you see that? Hear the dumpy sound of it? I love the alliterative combination of “belly and blanket” especially. There was something missing, something more than the absence of art on the walls. It was like the empty, eerie feeling that hollowed out his stomach when he watched one of the big cats, a Siberian tiger maybe, pace a worn trail just inside the glass of the enclosure. Stella slipped out the door as silent as an owl swooping in for a mouse. Well, certainly you notice all those soft ‘s’ sounds again in this simile! They’re in keeping with the description of something very quiet. Something else I love about this sentence is that it’s a description of animal behavior – which reinforces the setting of the whole book, as well as the nickname given to Stella by Whit, “Bird Girl”! How does Irene describe the differences between writing prose and poetry? Want to go behind the scenes of DON’T FEED THE BOY? Irene put together a great video all about the book which you can see here. And here is a Q and A with Irene describing the book’s inception, development, and publishing journey. Enjoy your own creative journeys this month! Robyn, you are a brilliant writer -- you make me sound like I know what I'm doing! :) Thank you for this, and for all you do to promote writing and writers and especially poetry. You are the Poetry Queen! And Janice, how wise you are to have Robyn writing this column. Thanks to both! Super post and I too loved the comparison between prose and poetry! Hi, Iza! I loved Irene's analogy as well - though it's funny, doing visual art and writing, I've always thought of visual art as "feline" and writing as "canine"! Joanna, thanks for your kind comments! Glad you enjoyed the post. One thing I love most about books like this is how much fun they are to read aloud. That's the joy of good poetry and good books: they sound so delightful! I loved this book. Irene is masterful in constructing a story that is poetic. Can't wait to get it for my library. Wonderful post about a wonderful book! Thanks, Ruth! Good to see you here.